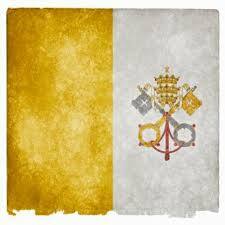 Vida Colorado: #7: The Holy See. I didn't get much time to sight-see in Rome, but on my first evening in the city I did find myself somewhat by chance walking west on the Via della Conciliazione at sundown. I didn't intentionally time things this way, but nonetheless, the timing was perfect. 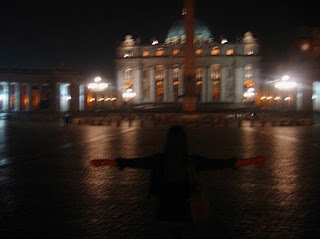 It was about 6 PM when we made it to St. Peter's Square, and instantly the setting impressed. And it should: the entire area was designed to make you feel as if you are in the presence of God. But that in and of itself doesn't set this place apart from any other Gothic or Renaissance era cathedral, the difference here is the colonnade. These sweeping set of columns four rows deep reach out from St. Peter's Basilica and meet you as you enter the plaza. This is Vatican City. The intended effect: the outstretched arms of God welcoming you into his own house. I'm not much for object worship, or placing undue importance to something that is made of stone and was just built by some dudes (those 'dudes' in this case being Bernini and Michelangelo), but man is this setting powerful. When combined with the sun setting right behind the cathedral, the reds and pinks reflected by the smooth stone of the plaza and the long shadows thrown out by the pillars, this made for a scene that I can't justly recreate in words. I'm not sure if God literally met me there that evening, or the colonnade in those moments were actually His arms or just a representation of them (there's a little transubstantiation joke in there for you reformation scholars! ), but whatever it was, it was a spiritual experience in the truest sense of the word. It's hard not to understand why thousands flock to this plaza to hear mass from a mere mortal and with this backdrop have no doubt in their minds that he is an envoy of God himself. I've never been so emotionally manipulated by bricks and stone in my life; I was taken away, but I loved it all. Of course, a post about the Vatican without mention of the inside of St. Peter's or the Sistine Chapel would be incomplete. After this quiet evening with only a few of us taking in this incredible structure by ourselves from the outside, I did return a few days later to brave the inside of the place. Yes, it was impressive. Yes, it was incredible to finally see in person what I'd heard about and seen in books since I was a child. But the crowds, the noise, the sheer hurried nature by which everyone scurries about made the serenity of the plaza at sundown a much preferable alternative. Maybe it also had to do with the guards (not the cool ones dressed like nutcrackers) who repeatedly in English had to yell "No pictures!" to the clueless and unresponsive crowd. I mean, every single person there has the mentality of: "I freaking traveled half way across the world to see this place, you'd better believe I'm getting a damn picture!" And the cycle continues. As I became even more aware on my trip to Rome and my time on La Sapienza's campus speaking with skeptics and believers from all around the word, the Vatican and the papacy has been and always will be the source of immense controversy... but nothing at all is controversial about the Vatican itself. It's simply incredible, and to my untrained architectural eyes is one of the most impressive structures ever built by men. A fitting setting for such an important crossroads in the world's history. before I knew what 'camera shake' was.